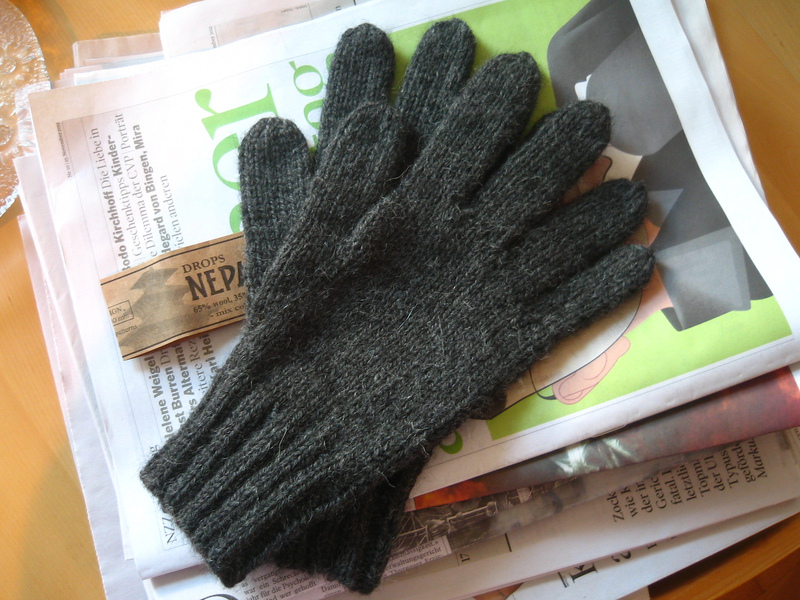 This entry was posted in Inspiration and tagged christmas, gift knitting, gifts, gloves, hat, knitting, knitting for men, men, scarf, sock on July 31, 2013 by onemilljellybeans. Holy crap, Christmas is coming soon! (Even if you don’t do the whole Christmas thing, there’s always an excuse to do some gift knitting.) 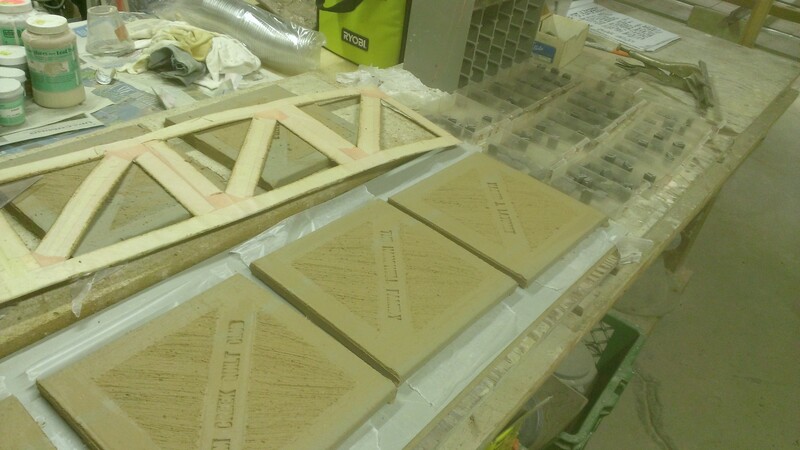 So, what to make? 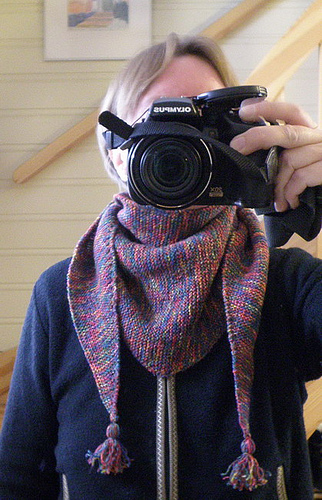 This week, I’m trolling Ravelry for ideas for gift knitting projects. Follow along if you’re looking for something, too. This entry was posted in Inspiration and tagged christmas, gift knitting, gifts, hat, knitting, knitting for women, mittens, scarf, women on July 29, 2013 by onemilljellybeans. 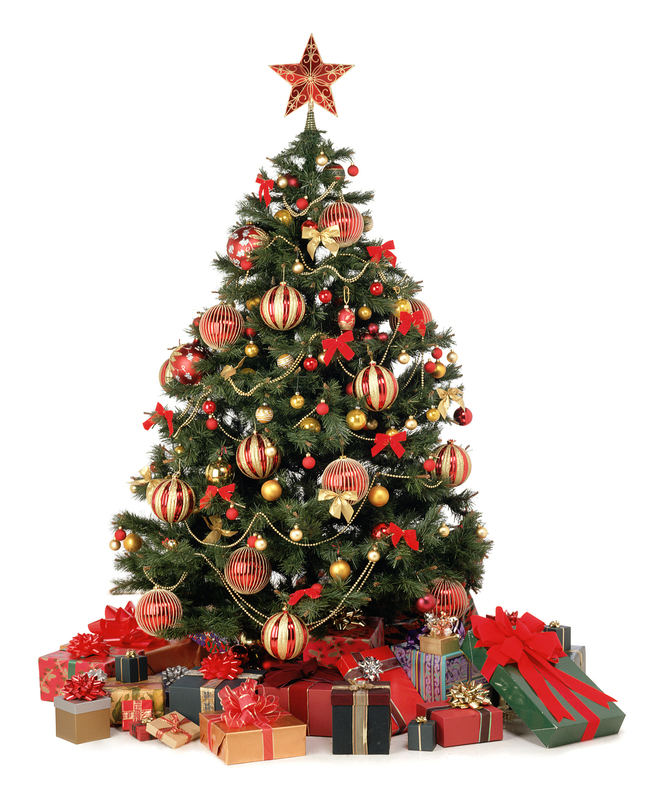 Christmas will be here in 5 months from yesterday. 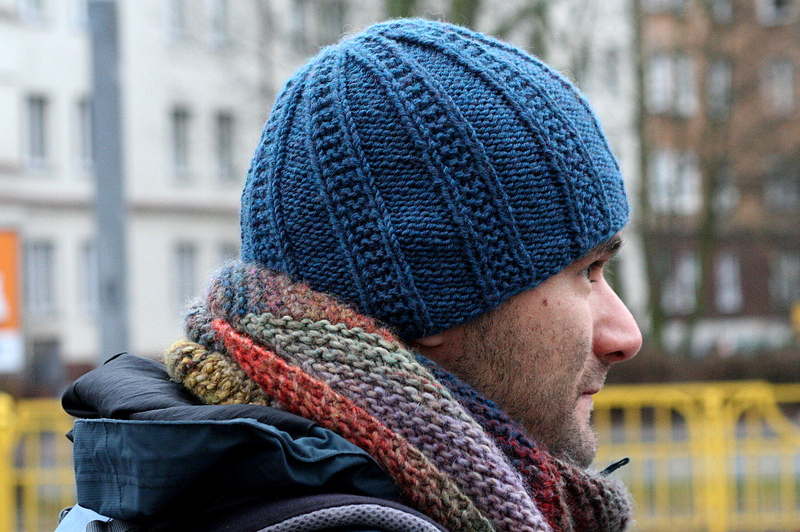 If you’re planning on doing knitting for Christmas gifts, you should start thinking about it now. 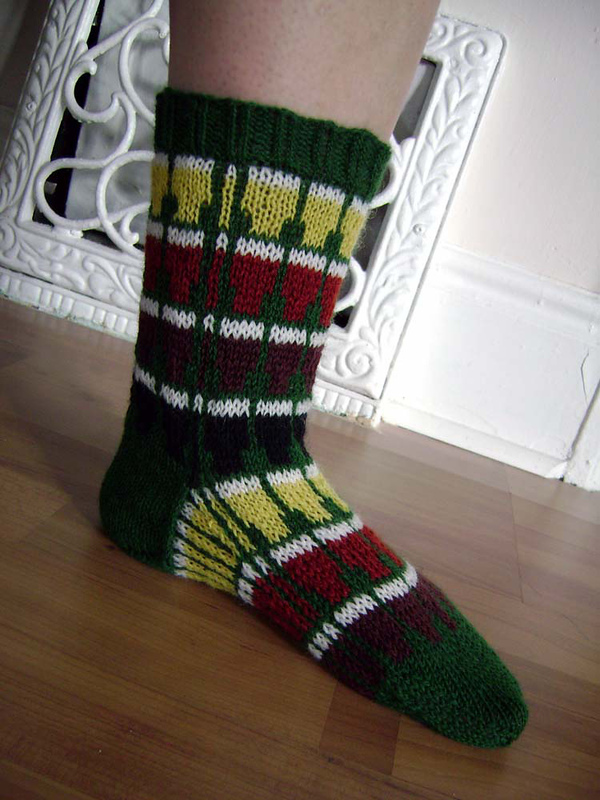 This entry was posted in FYI and tagged christmas, gift knitting, gifts on July 26, 2013 by onemilljellybeans. Keep your coffee comfy and cozy with this cup-sized sweater! If you’re as caffeine-addicted as I am, you know how important it is to keep your coffee nice and hot, while avoiding burning your fingers. 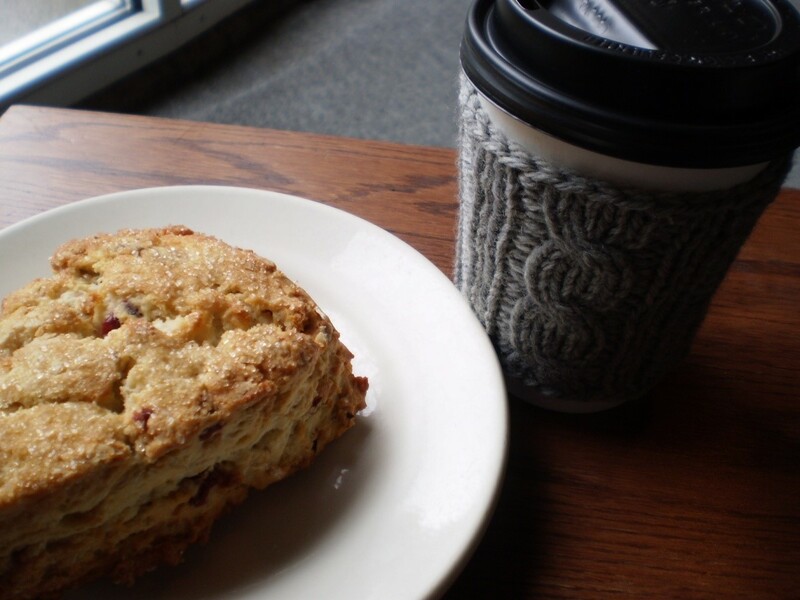 This coffee cup sleeve is super-fast to knit up, and the addition of a few simple cables will keep the attention of even the most caffeine-addled knitters. Since it’s a small project worked with worsted-weight yarn, you can make several from a single skein of yarn, making the Coffee Sweater a great pattern for gift knitting. This entry was posted in Patterns and tagged cable, coffee, coffee cozy, coffee sweater, gift, gift knitting, knit, pattern, ribbing, sweater on July 24, 2013 by onemilljellybeans. 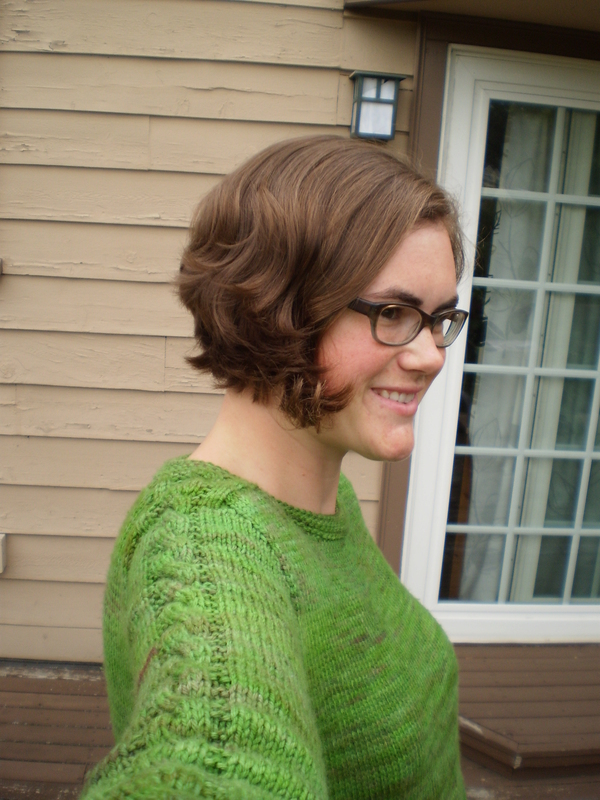 A hopeful young knitter named Allison found a beautiful pattern called the February Lady Sweater. It was gorgeous… cozy, comfy, lacy, and a beautiful shade of green. She had to have it. As a graduate student, Allison went the cheapest route and bought a whole pile of white yarn from Knit Picks and dyed it with food coloring. It turned out… with varying results. 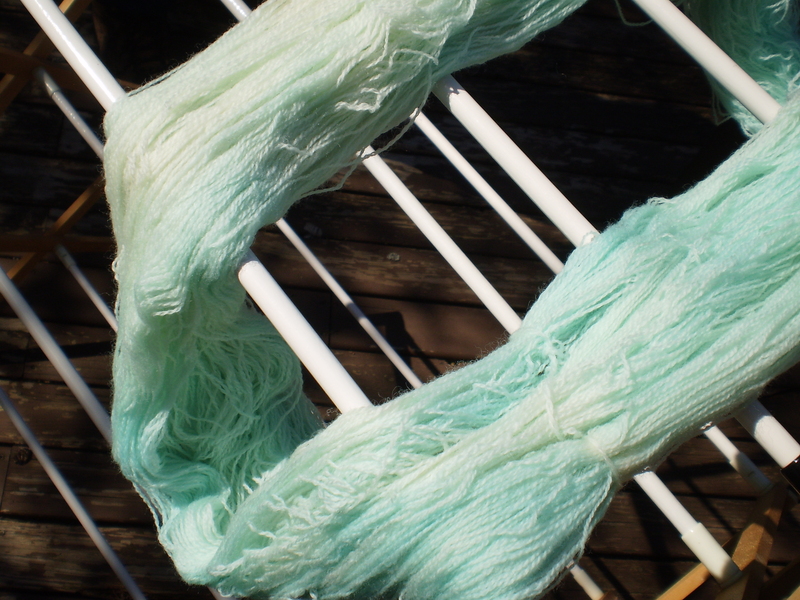 Some of the skeins were greener, some were browner, and one even had bright red blotches in it. It was odd, but it wasn’t going to defeat our knitter. She went ahead and meticulously knit up the February Lady Sweater, carefully using each skein for only a few rows to mix the slightly different yarns throughout her sweater. After months of work, and weaving in hundreds of ends, she was done! She tried on the sweater and! It was chunky, too big, and looked like the worst, most stereotypical maternity clothes. Allison wore it twice (out of stubbornness) and threw it to the bottom of her closet, where it was never thought of again. 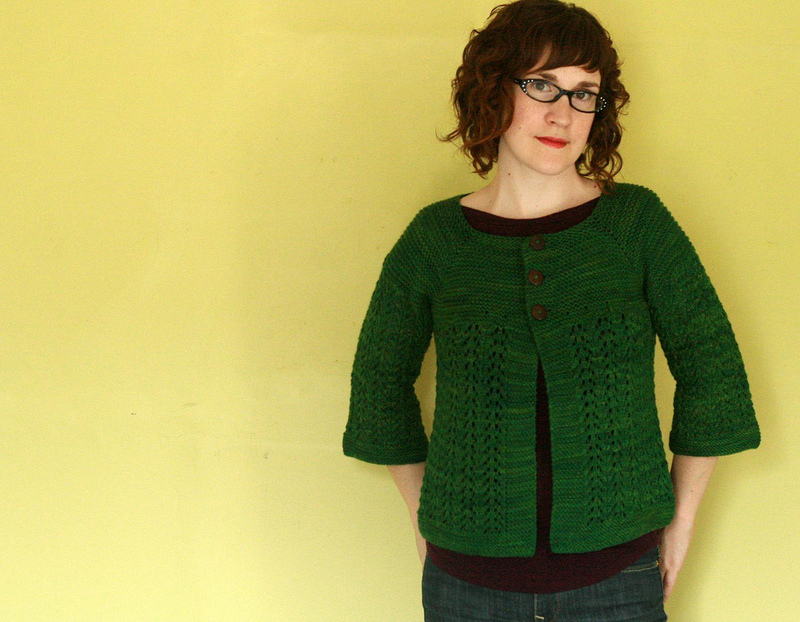 In the summer of 2010, Allison got the itch to knit another sweater, and remembered that green yarn from two years ago, and went to go dig it out. She found the terrible sweater, and tried it on again (just in case). It was still ugly. So, she ripped out the entire thing and balled it all up into a million golf ball sized skeins of yarn. In the years since she had first knit the sweater, it had sat at the bottom of the closet becoming permeated with dust. Unraveling the sweater and rolling up the balls of yarn caused both Allison and her husband to have massive allergy attacks. So, out of spite, she hid the yarn away again, refusing to knit with something that made her sneeze like she had rolled around in a pile of cats. Around Christmas 2012, Allison got it into her head that she wanted a new sweater. Something plain, with nice long sleeves, and maybe a simple cable down the sleeves (because why not). She cast on, carefully spit-joining the ends of all her little skeins of yarn. And, before she knew it she had the top half of a great pullover: sleeves, crew neck, shoulders, and a good 10 inches of body. Excited, she tried it on: the sleeves looked perfect, the neck was great, but the body of the sweater was way too big. More determined than ever, Allison ripped out the body (again) and reknit it, this time decreasing on the sides to bring the size down. She tried it on (again), and was dismayed to find out that the sweater looked even worse than before! The body fit around the waist, but now there were weird puffy bits in the armpits of the sweater. Not good! She ripped out the body once again and reknit it, this time adding k2p2 ribbing panels on the sides. She held her breath as she tried it on once more. It fit! It looked good! Hooray! She flew through the remaining 6 inches of body and bound off as quickly as she could. She blocked out the sweater that night, and kept coming back to look at it as it dried. 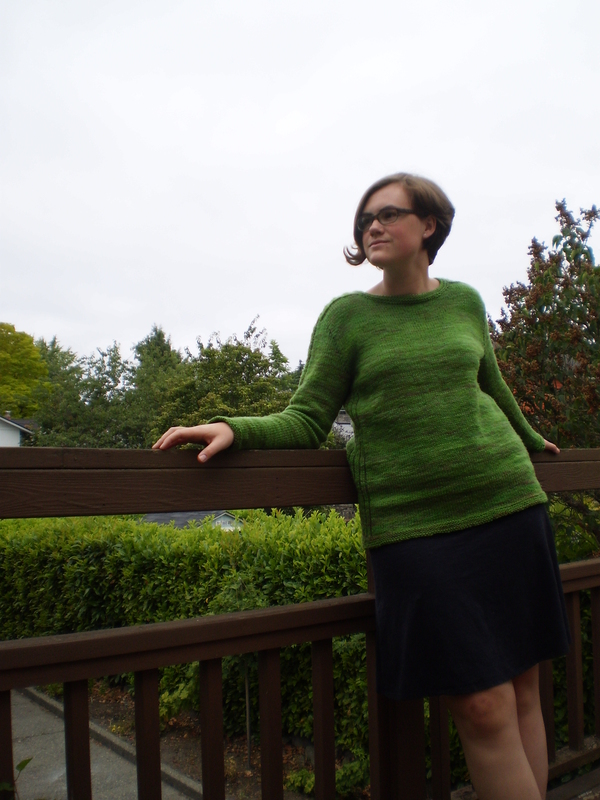 Two days later (Seattle is always slightly damp, even in summer), the sweater was cozy and dry! Allison excitedly put on the “finished” sweater, and was heartbroken to realize that the sleeves, after blocking, were a good 4 inches too long. After a bit of pouting, she ripped the cuffs back and reknit them in an evening. Finally! The sweater was done! It had been five years since she had purchased the yarn, she had tried two patterns, and had at least 4 major froggings, but at last she had something to show for her work. So, the moral of the story? Never, ever, ever, give up. That’s the great thing about knitting. No matter how bad you mess up (unless you set your yarn on fire or something), you can always remake a pattern, fix your mistakes, or totally reknit your yarn. 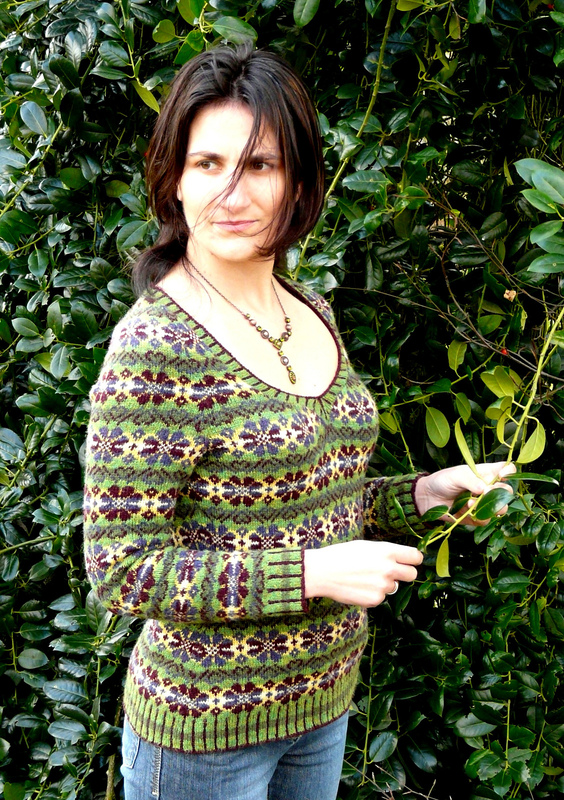 This entry was posted in FYI and tagged february lady sweater, frogging, knitting, persistence, reknitting, saddle shoulder sweater, sweater on July 22, 2013 by onemilljellybeans. Dying is super fun and rewarding (and surprisingly easy). It’s a great way to play with yarn when it’s too hot to sit around with a big pile of sweater on your lap. There are a million ways to dye yarn, but this is the easiest one I’ve found. You probably have everything that you need in your kitchen right now. I’ll do further yarn dying posts about more complicated dying processes later, but this should get you started (and you end up with a whole bunch of fruity-smelling yarn). Please note, this will only work with wool or animal fibers (cashmere, angora, silk, etc.). 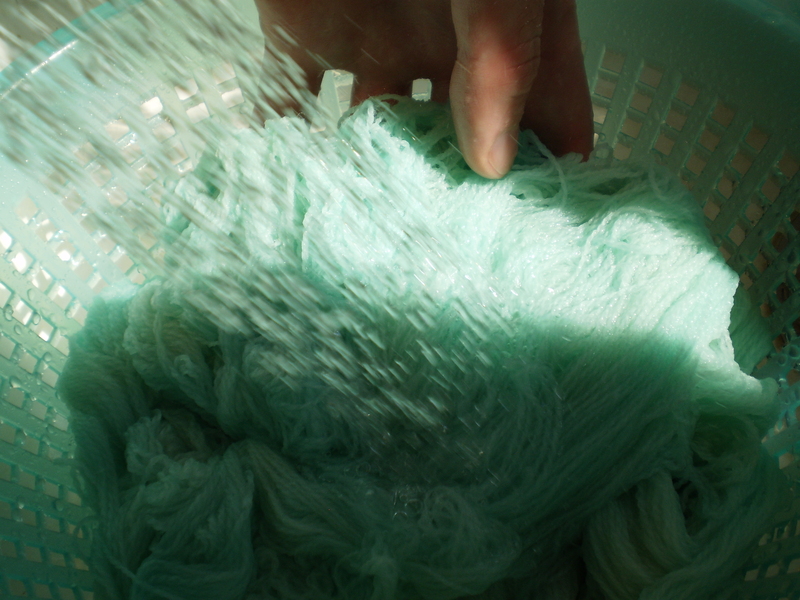 Dying other fibers (cotton, linen, anything synthetic etc.) takes a lot more effort as well as some fairly toxic chemicals, so I don’t bother with that. But doing this is super easy and fun. It’s a little like making magic potions, and you can do it with kids, if you’ve got some around that want to help. Wool. Duh. You can use a wool blend, but know that the wool fibers and the acrylic (or whatever) fibers will take up the dye differently, which can give you a heathered look. Superwash wool works well, and you won’t have to worry about your yarn getting felted in the process. You can dye colored yarn or white yarn, just know that if you start with dark yarn, you’ll never dye it so that it ends up lighter. If you’re trying to get bright or pastel colors, start with white. 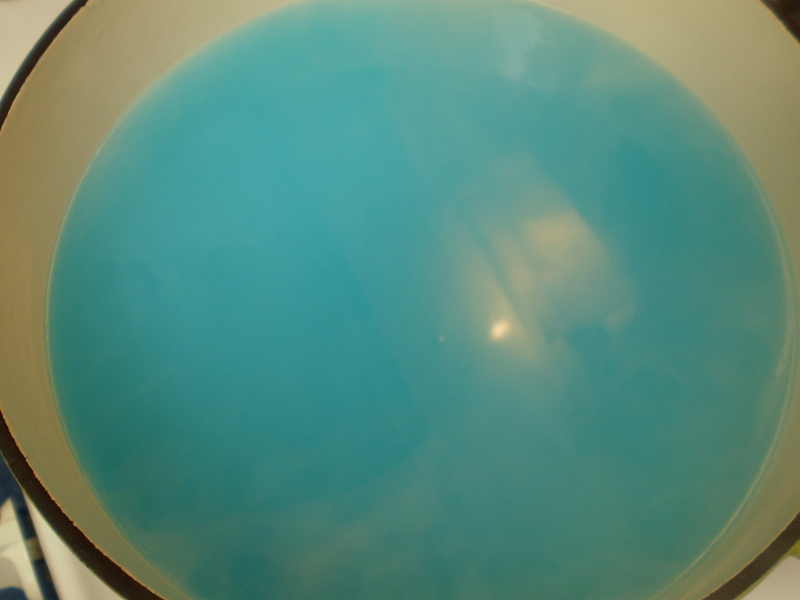 Kool-Aid (in the color of your choice) I’m using “Ice Blue Raspberry Lemonade”. Get the kind in packets, not the kind in the big tubs with sugar pre-added. Water-From the tap. Nothing fancy. A non-reactive pot in which to do your dying. A stainless steel, enamel or non-stick pot works well if you’re trying to get a solid (or mostly solid) color. Copper or cast iron pots can cause weirdness when you try to dye in them. Soak your yarn in warm water. Make sure it’s nice and wet through. If the yarn is wet to start with, it will take up color more evenly. Mix up your dye. 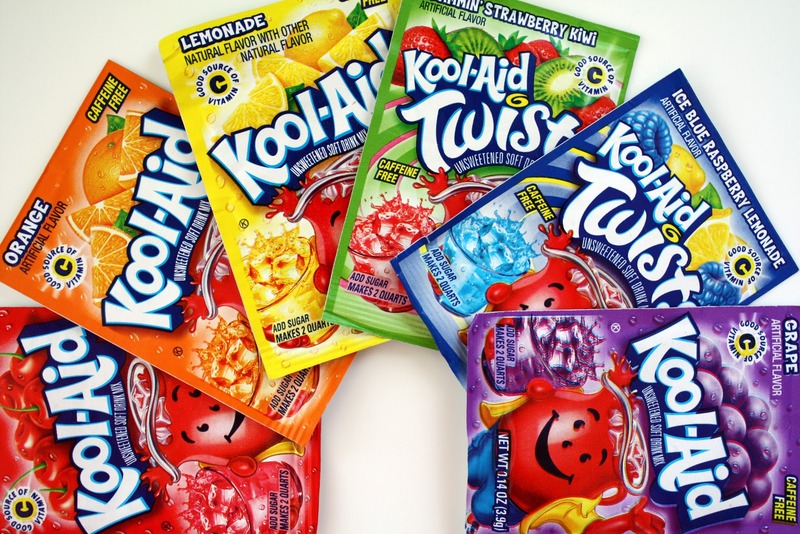 Just add a packet or two (or three or four) of Kool-Aid to a pot full of water. It’s better to err on the too light side than the too dark side, since you can always add more color, but you can’t remove it. I’m going for a pastel blue color, so I’m going with just one packet of color. Heat up your dye until you just barely start to see little bubbles. Don’t actually boil the water, but get it close. When your dye is steaming hot, and just about to start simmering, turn the heat way down and throw in your yarn. Submerge all your yarn at once, and poke it around a little bit, so that each strand of yarn gets plenty of exposure to the dye. 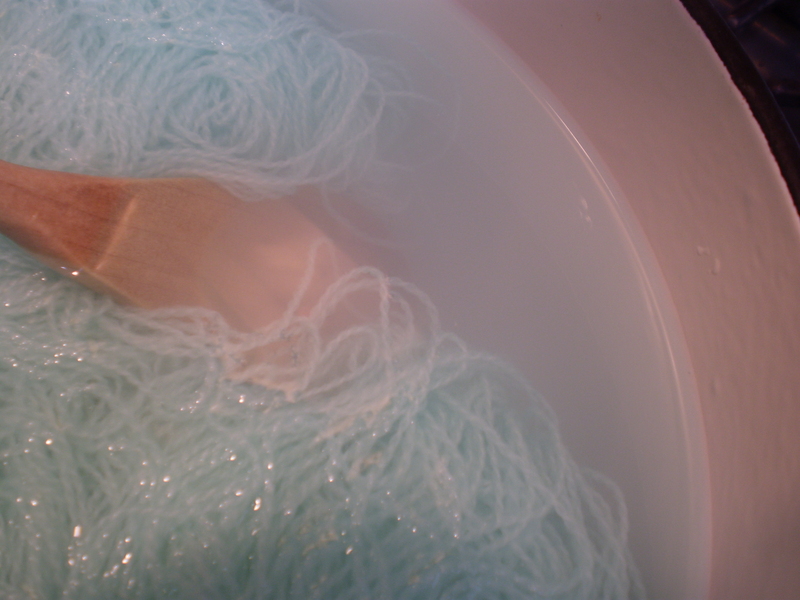 Carefully (without burning yourself) move the yarn to a colander, and rinse the yarn under hot water from the tap. Slowly lower the temperature of the rinse water until you can touch it without burning yourself. 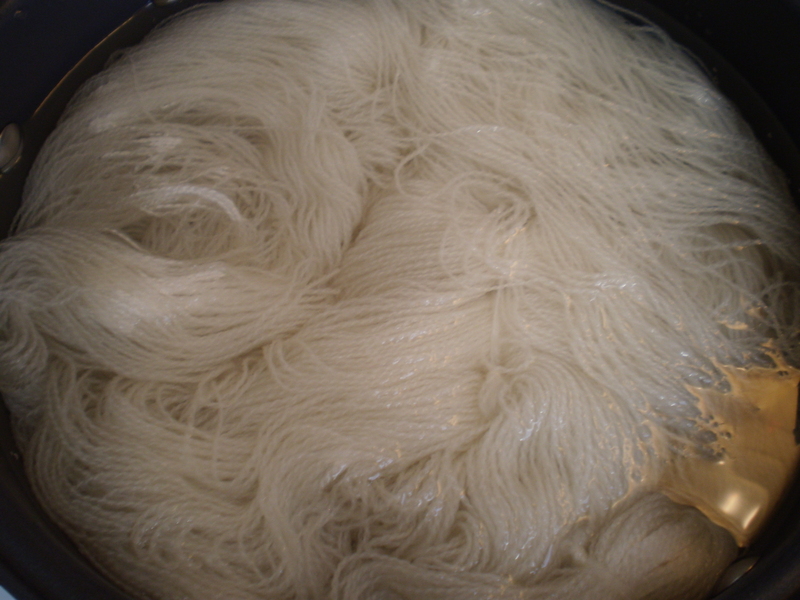 Don’t immediately shock the yarn with cold water, because it can damage the yarn and cause felting. Once you can touch the yarn without screaming in pain, keep rinsing out the yarn, gently flipping and turning it until no more color rinses out of the yarn. If you are happy with your color, hang up the yarn to dry. If you want to add more color (this is called over-dying) go through the steps again with more dye. 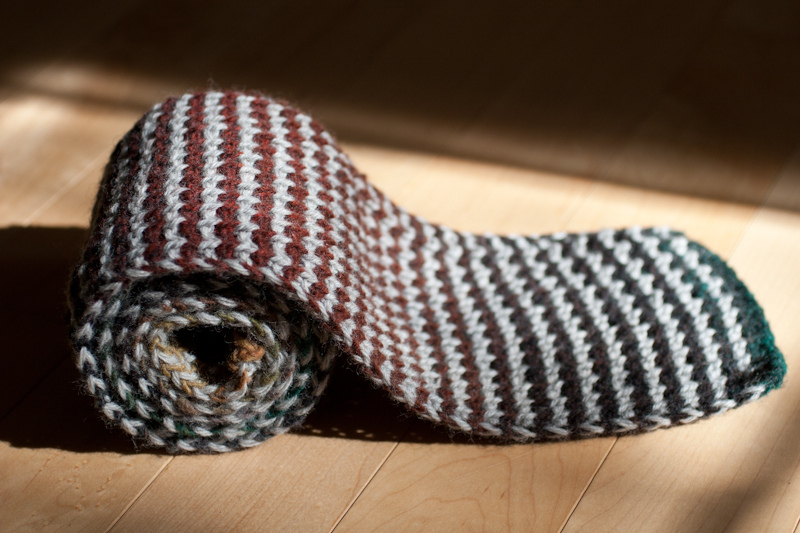 Knit something fabulous with your new hand-dyed yarn. This entry was posted in Techniques and tagged colors, dye, dying, kool aid, tutorial, wool, yarn on July 19, 2013 by onemilljellybeans. I promise to get back to our regularly scheduled program on Friday! This entry was posted in Uncategorized on July 18, 2013 by onemilljellybeans. 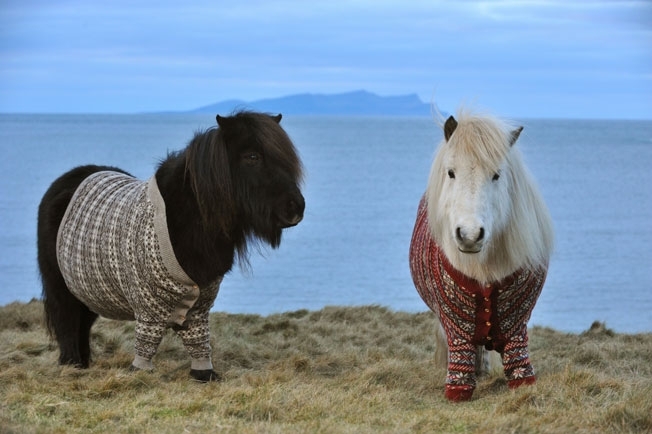 This entry was posted in Inspiration and tagged fair isle, inspriation, ponies, sweater on July 15, 2013 by onemilljellybeans. I’m the one in green with the black helmet. I love this picture because I look kind of terrifying. Usually in derby photos I just look scared and awkward. 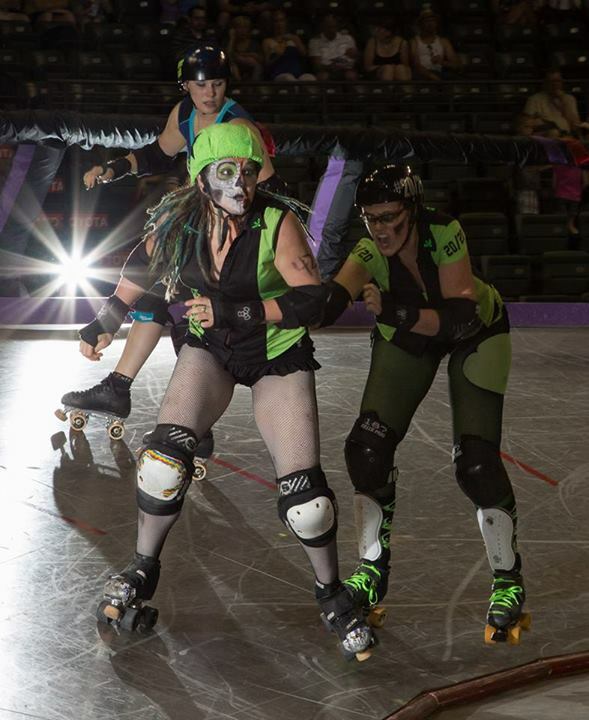 In this picture, I’m giving my jammer (the girl in front of me who wears stars on her helmet) a push to make her go faster. The jammer is the one that scores points by lapping skaters on the other team. (I’m a blocker, whose job it is to help our jammer go faster, and stop the other jammer.) If you are interested in the rules, this is a good overview. Anyway, a friend of mine, who also plays derby, asked me to make her a jammer hat for her birthday, and who am I to say no? I looked through some of the available patterns, and I didn’t care for them, so I made my own pattern. Now you, too can channel your inner badass with this roller derby-inspired hat. 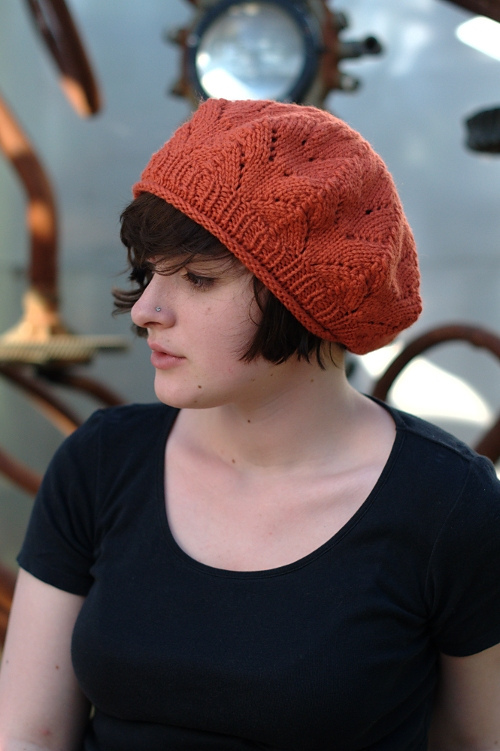 It’s knit in the round with a simple ribbed cuff and decreases on the crown. The stars are added using the duplicate stitch after the hat is knit up. 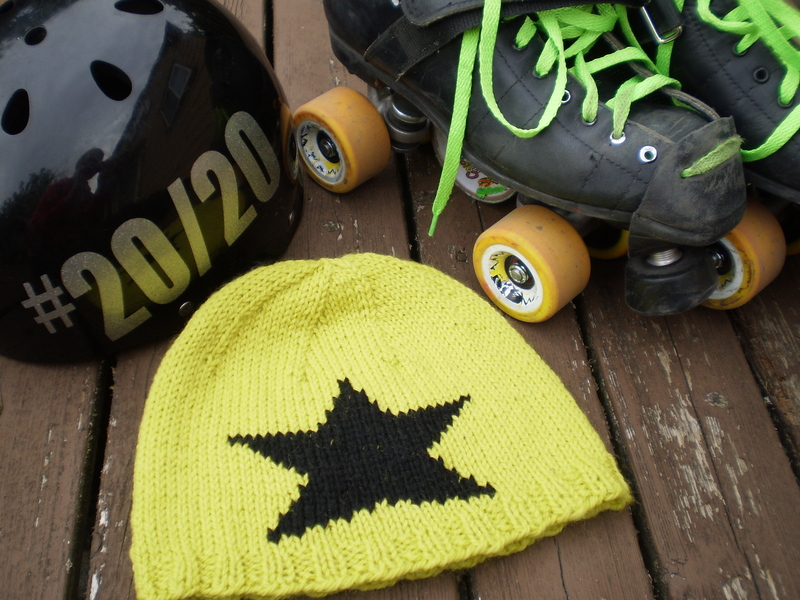 Knit this super simple hat in the colors of your favorite roller derby team to show your spirit. And don’t forget: skate fast, turn left, and hit hard! This entry was posted in Patterns and tagged derby, duplicate stitch, hat, in the round, jammer, pattern, roller derby, star on July 12, 2013 by onemilljellybeans. 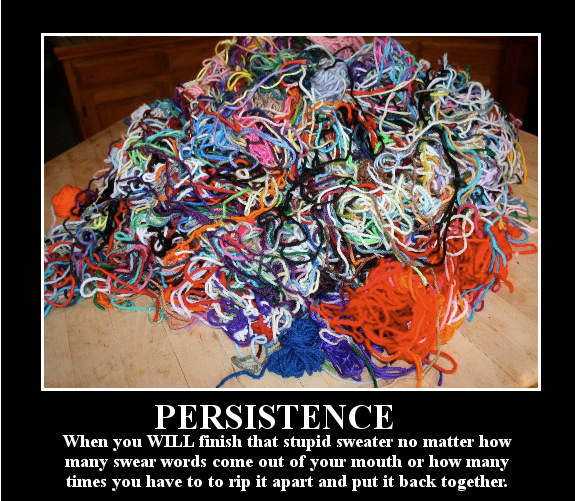 Sure, knitting is an effort-heavy process, but don’t lose all hope! I’ve got a great little trick for making color work super easy. 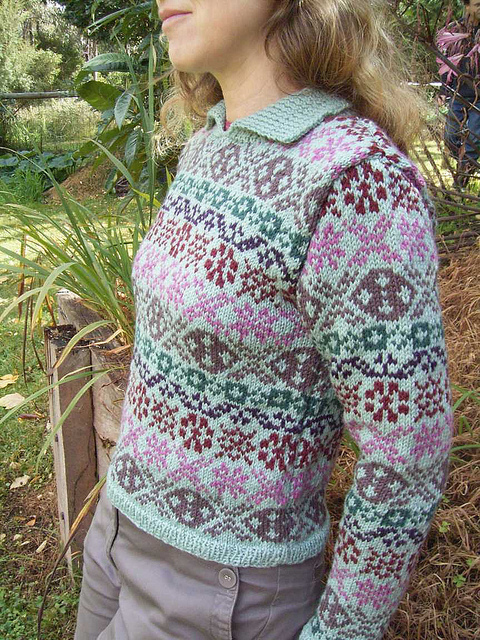 Let’s imagine that you want to put a nice little fair isle border on the cuffs of your new sweater, or maybe knitting an intarsia heart on a little girl’s hat. Your project would end up really cute, but it would be a total pain to do. I don’t know about you, but I like just making plain old stockinet stitch garments (easy!). So, what’s a girl to do? That’s where the duplicate stitch comes in. The duplicate stitch is technically an embroidery technique that you can use to decorate knitted fabric after it has already been knitted so that it looks as if the decorative pattern was worked as the project was knit up. I like using it for projects that have only a little bit of fair isle (which can be a pain to do for only a row or two at a time), or any pattern that wants you to do intarsia in the round (which is almost impossible). And, I’ve even made a video for you. Enjoy, and let me know if you have questions! This entry was posted in Techniques and tagged color work, duplicate stitch, Embroidery, knitting, tutorial, video on July 10, 2013 by onemilljellybeans.